The Line 6 Helix LT guitar processor features the same advanced HX Modeling technology found in the Helix Floor and Helix Rack processors. With a streamlined I/O complement and hardware configuration, the Helix LT guitar processor delivers the highest levels of performance, flexibility and control in its class. The award-winning HX Modeling engine leverages powerful dual-DSP performance to capture and recreate amps, cabs, mics and effects with authenticity and responsiveness. A large LCD and touch-sensitive footswitches with color LED rings enable easy usage and fast, smart control. The generous I/O complement, with extensive routing capabilities, makes it easy to integrate Helix LT into an existing rig and provides flexibility for a wide range of stage and studio applications. 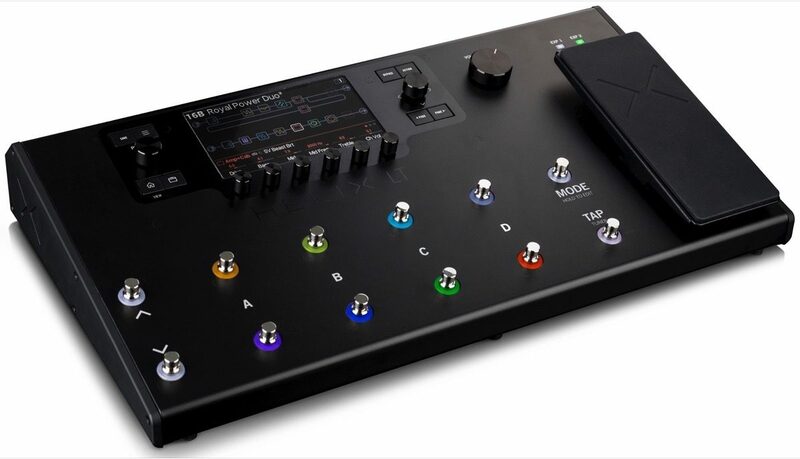 Helix LT has preset compatibility with existing Helix products and also offers Variax guitar control integration. With Helix LT, the world's most powerful guitar processing platform is now more accessible than ever before. 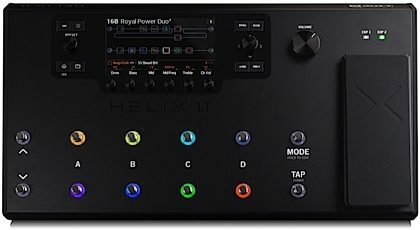 Powered by the HX Modeling engine, Helix LT offers greater DSP power than any other multi-effects processor in its class. Tube amplifiers are recreated with authentic sound and feel -- each amp component has been captured, measured and matched to the real thing. Mics, cabs and effects are recreated accurately and are designed to sound instantly recognizable if you've ever spent time in a studio. 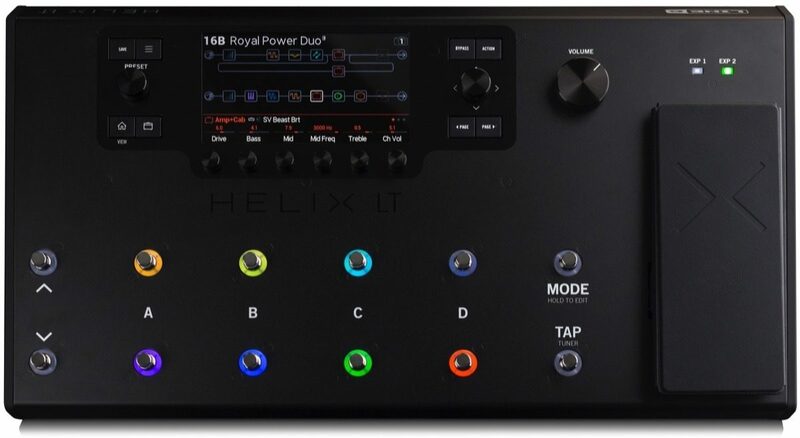 Helix LT also lets you load custom impulse responses to personalize your rig setup. With uncompromised Helix sound quality and 123 dB of dynamic range, Helix LT ensures an authentic and responsive playing experience. The Helix LT processor delivers the advanced user experience similar to the Helix Floor and Helix Rack processors, with a clear and intuitive interface that enables fast tone creation and easy interaction -- all with a minimal learning curve and the elimination of complex menu diving. A large color LCD lays out the entire signal chain and provides instant access to amp and effects parameters. 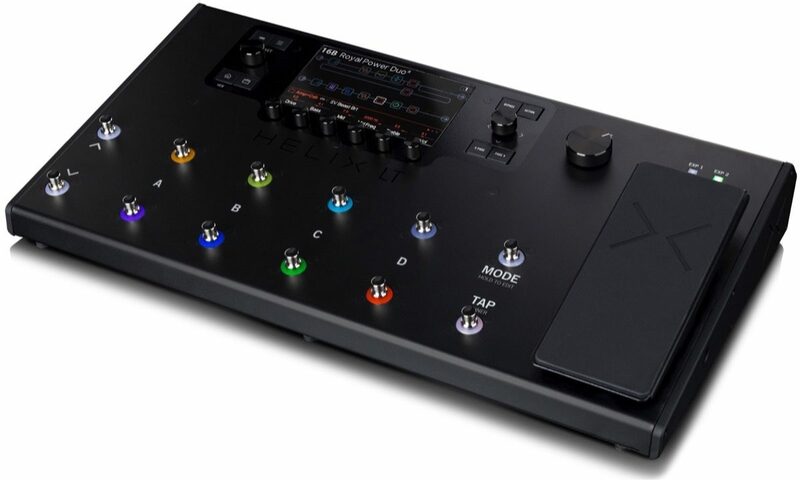 Helix LT features the same touch-sensitive footswitches as Helix Floor and Helix Control, allowing you to select an effect block for editing simply by touching it. Color LED rings enable you to know what is assigned to each footswitch at a glance. Helix LT also has four stereo paths per preset, allowing you to design complex routing scenarios for each patch. Part of the goal in developing the Helix family of products was to allow guitarists to interact with technology in ways that are more intuitive, making the creation of tones easier. This means you won't have to stop playing to tweak a knob. With Pedal Edit Mode, you can edit any parameter you like using your foot; just select the block and parameter you want to change and adjust its value using the expression pedal. Featuring a best-in-class I/O complement with extensive routing capabilities, Helix LT provides advanced flexibility for studio and stage applications, and can be easily integrated into any live performance rig or studio setup. L6 Link connectivity enables smooth digital integration with compatible Line 6 products, including StageSource speakers for an optimized experience when playing live. Exclusive Variax guitar integration provides even more control and creative inspiration, with instant model and tuning recall, effects control and power for Variax guitars. Like all hardware products in the Helix family, Helix LT presets can be created and edited using Helix Edit software for Mac and PC. The Helix Edit software allows you to drag and drop amps, cabs, and effects to build complex signal chains. Quickly reorganize, rename, edit tones and modify Performance View labels, instantly visualizing every detail of your editing workflow -- all right on your computer. Featuring the same sounds, workflow and editor as the Helix Rack and Helix Floor processors, Helix LT presets are compatible with existing Helix products, including Helix Native plug-in software. This makes Helix LT an excellent option for guitarists who want a streamlined setup for live gigs or touring, or who want a backup for their Helix Floor or Helix Rack processor. Line 6 is committed to continuing the evolution of the Helix family and responding to the needs of guitarists. Following the path of Helix Floor and Helix Rack, Helix LT customers can expect regular firmware updates that add amp and effect models, features to improve flexibility and workflow, as well as other software improvements. This review has been selected by our experts as particularly helpful. "Amazing product!" Sound: The sounds out of this box are second to none. Some of the best modeling tech I've ever used. It's the closest to a tube amp I've used. It responds well to pick dynamics and guitar volume control. Again learn about EQ'ing to your particular output device. You can literally dial in any sound you can think of. There are a couple hundred presets. Some can be used out of the box, others are solid foundations for building your own sound around a particular amp. The effects available are all usable and you can get very creative with where you place them in your chain to create totally unique sounds. Whether you are looking for high gain lead, chunky rhythm, or haunting ambient tones, take your time and you can create whatever tone you are looking for. Feature: The input output options are more than enough for the average home or working guitarist. The USB is multi channel and is an amazing USB recording interface for your DAW. The ability to record a dry track along with your modeled sound at the same time is a great tool. Then you can go back and play that track back through the LT and tweak your sound real time to fit your mix. No more spending time getting your guitar sound the way you like it only to realize 2 days later than delay you used isn't quite what you want. Ease of Use: The onboard editing is intuitive and great for quick on the fly changes. The HX Edit computer software is very easy to use as well, and graphically similar to the onboard editor so you don't need to learn 2 tools to tweak your tones. Quality: The unit is constructed very well. It's definitely road worthy, and it's not too bulky for your home studio set up either. Value: The LT is in line with the Headrush and the new Boss GT-1000. It's not inexpensive, but you are getting ALL the sounds of the full Helix. I think it's a good value. Manufacturer Support: I haven't needed to contact Line 6 for any of my products so I can't really comment. I can say that the Line 6 forums on their website are a great resource for tips and tricks, and links to tutorials all over the web. There's also a user sound library where you can download and try out patches the community has created. A great place to get a starting point for a particular artists sound. Line 6 also has been updating the unit regularly, often adding more features and amps with updates. The 2.5 update is coming soon, and will be bringing a ton of new and legacy Line 6 effects to the box. I can't wait for that one!! The Wow Factor: I am very impressed with the sounds I can get. But again, it may require some work on your end to get the sound you want out of the speakers you are playing through. Overall I am very very happy. Overall: Modeling technology is a blessing and a curse. Blessing - the convenience of having a semi truck full of gear in a floor board you can take anywhere and plug into anything is something I never dreamed of when I first started playing. Curse - modeling technology is an art in itself, and requires a healthy knowledge of EQ, signal chains, and other less often mentioned aspects that many of us older guitar players just aren't used to. Even if you have used a modeling amp like a Vypyr, Mustang, or Spider before, keep in mind that those units have a speaker built in so the sounds are for the most part already EQ’d for that full range guitar speaker. Here you have a blank canvas, so you may have to tailor your EQ and signal chain to fit whatever output device you are using. The best advice I can give anyone interested in this product is do your research! Decide what you area going to be playing the board through first. PA system, Headphones, Studio Monitors, Guitar Amp, FRFR etc Then join some forums, watch YouTube, and to understand how to create usable sounds for your particular set up. I’ve seen too many threads by people who are frustrated because they can’t get a good sound. Once they were steered in the right direction for their particular set up, the majority were quite pleased. Overall: I have owned a pod hd500x, x3live, and an atomic amplifire. I have also owned many great tube amps from Mesa, Orange, Marshall, Hiwatt, Vox, and Rivera. In my search for tone I found great sounds out of all of those amps but nothing that I could stick with as my styles of music changed. The Pods gave me the flexibility but I could never get a great tone. The Amplifire gave me the tones but lacked the effects and had a slightly annoying digital artifact that I could hear as notes decayed. At first when I got the Helix I was ready to send it back after an hour. After taking some time digging into the adjustments and watching some youtube videos. I started to get some great tones out of and now that I have a better understanding of the workflow I can have a great tone for any style in minutes when I used to spend hours dialing in the hd500. The icing on the cake was learning the snapshot function. I have snapshots for each song on my bands set list and it has made the pedal dance obsolete.